The role of religion in society will be explored on a new program, a joint production of public radio stations WETS-FM/HD (89.5 MHz) in Johnson City, Tennessee and WEHC-FM (90.7 MHz) in Emory, Virginia. Religion For Life will be heard on WETS Thursdays at 8 pm with a rebroadcast Sundays at 2 pm. It will be heard on WEHC Mondays at 1 pm following "Fresh Air"
This half-hour educational program will focus on the intersection of religion and public life and religion and social justice. The locally produced program will feature interviews with local and national figures from a variety of religious traditions and from a variety of perspectives, and will address the effects of religion – both positively and negatively -- on public life. The host of the program is the Reverend John Shuck, a Presbyterian minister for 19 years and currently the minister at the First Presbyterian Church of Elizabethton, Tennessee. 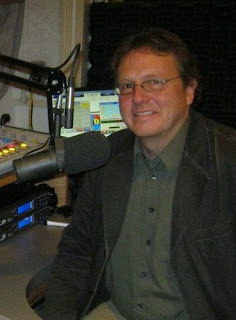 Prior to entering the ministry, Shuck was a radio broadcaster at stations in Boise, Idaho and Seattle, Washington. Upcoming programs include author Sarah Sentilles whose latest book, “Breaking Up With God” recounts her disillusion with the church and its patriarchy. She took leave of the church and let go of a belief in a personal god just as she was about to enter the priesthood. Another program focuses on local activist Jennie Young, who is alerting Tennesseans about the encroachment of mountain top removal mining. She sees this destructive mining practice as a moral issue and shows how faith communities are taking the lead in resisting it. In other programs, Mazen Alsaqa, a Christian refugee from Iraq now living in Michigan, talks candidly about the violence against Christians and other religious minorities in Iraq and the causes of this violence since the U.S. invasion in 2003. Shuck also interviews Carol Landis, the chair of the board of directors for the Green Interfaith Network or GINI in the Tri-Cities. GINI is a coalition of faith communities taking an active role in care and advocacy for the environment and communicating accurate, scientific information to the public. WETS-FM/HD is a service of East Tennessee State University, and WEHC-FM is operated by Emory and Henry University. Podcasts of Religion For Life will be available at www.fpcelizabethton.org and more information about the program will be available on Shuck’s blog, www.shuckandjive.org as well as Facebook and Twitter. Carol Delaney, professor emerita at Stanford, about her books on Abraham and Columbus. If you don't live near our mountain, you can still listen live via live streaming both to WETS and WEHC. I am looking for interesting people (local and national) to interview for this program. Contact me with your suggestions. Totally cool and awesom! Talk about making a difference! Thanks Sea! I am excited about it! I want to have you on the show. Love to have you in the studio. Ever make it down this far? Thank you, Br. Tom! I appreciate you listening and for the gracious comment!